If you are one of Microsoft Dynamics partner staff, such as solution architects, functional, and technical consultants, Project managers, Independent marketing technology and process consultants, you need to pass Microsoft MB2-719 Microsoft Dynamics 365 for Marketing for MCSE: Business Applications certification. 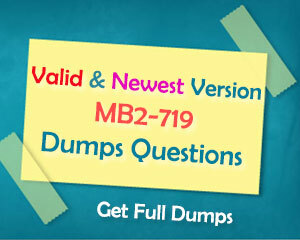 Valid Microsoft Dynamics 365 for Marketing MB2-719 Dumps will help you pass MB2-719 exam successfully. A. Add a marketing form as a child tile to a marketing email message. B. Add a marketing email message as a child tile to an event. C. Add a survey as a child tile to a marketing email message. D. Add a marketing email message as a child tile to a marketing page. B. the first time a lead opens your email. C. when the lead status reason is set to Qualified. D. when lead scoring sets the Sales Ready status to Yes. exclude contacts who have already subscribed to a subscription marketing list. A. Add a marketing list tile to the customer journey. Set the containment method field to Exclusion. Set the segment source field to subscription marketing list. Select your subscription marketing list from the list of available subscription marketing lists. B. Add a new segment group tile to the customer journey. C. Add a new update record tile to the customer journey. D. Add a new segment group tile to the customer journey. Add a child segment tile to the segment group tile. about the emails displays in Customer Journey Blocked Email Insights. E. The contact’s email server was not online when the email was sent. A. Use the Basic Preview option. B. Use the Inbox Preview option. C. Test and send the email. D. Use the HTML Preview option. A. Lead records were not related to contact records. B. Lead records were not included in a business workflow. C. Lead records did not have an email address. D. Lead records were not related to account records. 11. You create a customer journey for a group of contact records. Move 60 percent of the contacts on a different path in the journey than the other 40 percent. 12. Your company uses LinkedIn to synchronize lead records. Creation of new lead records has stopped. You need to identify the cause for the issue. Which three items could cause the issue? Each correct answer presents a complete solution. A. The LinkedIn company page was deleted. C. The LinkedIn user profile credentials changed. D. The system administrator security role is removed from the LinkedIn Campaign Manager user. E. No new leads have responded to the company’s LinkedIn ad campaign.